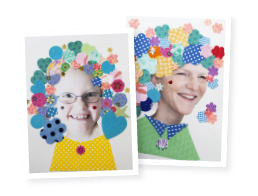 Freja and I are experts at collecting good “craft materials”. We save everything! And we are in constant need of smart storage. 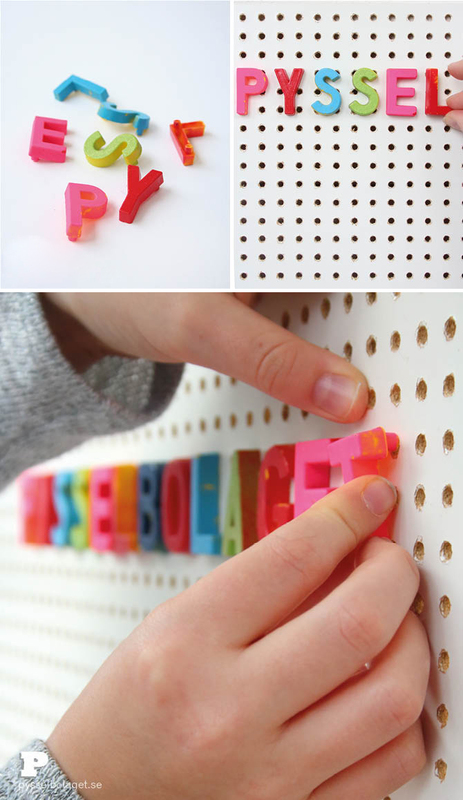 Today we’re prepping a pegboard – the Crafty Swedes way. 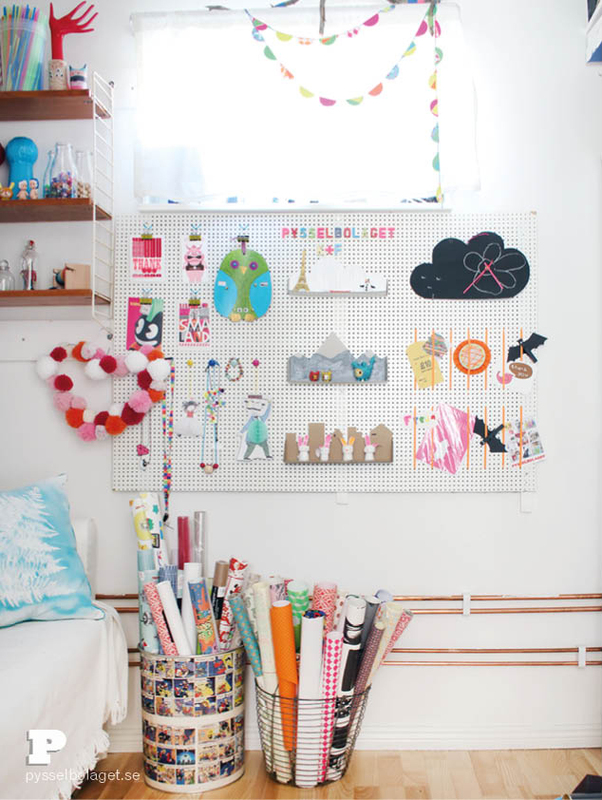 You need a pegboard and a frame work. 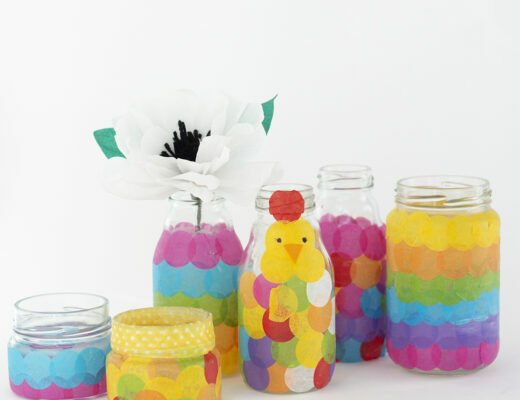 Check out Helena’s post, she has a tutorial of how she built hers. Helena also made her own clever hooks, she has tips on shelves for pegboards and other clever sulotions. Paying her blog a visit is always a pleasure. 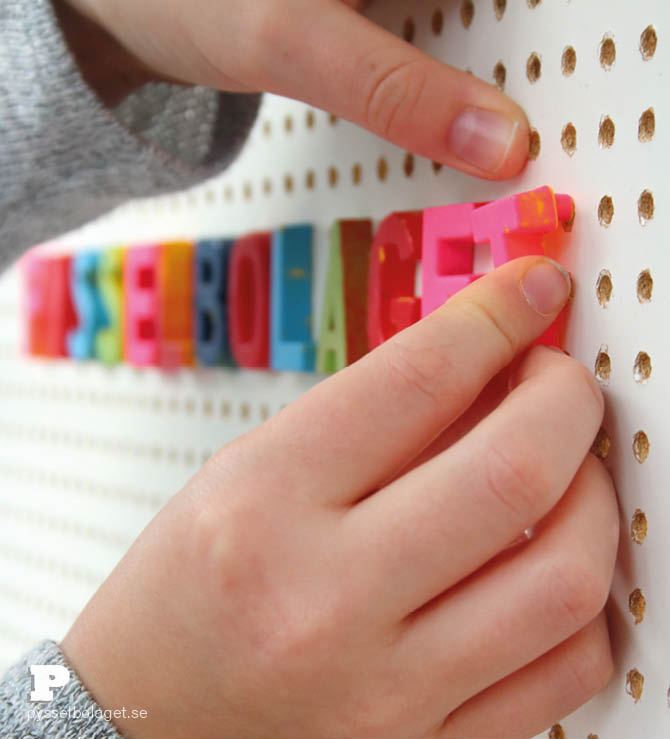 The things we’ve used for our pegboard is mainly stuff we had at home. You may not have exactly the same things in your home, but we hope we can inspire you to take a look around your house. 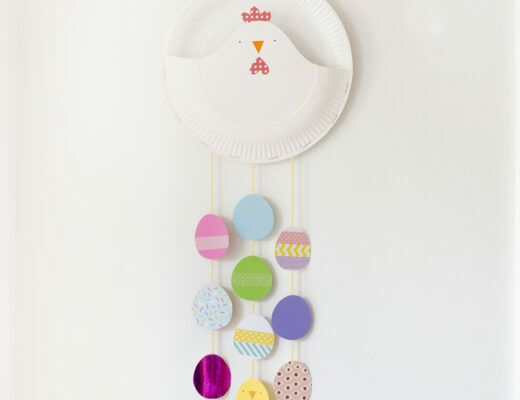 We knew from the beginning we wanted to hang cards and pictures on our pegboard. Foldback clips decorated with pieces of tape does the trick. 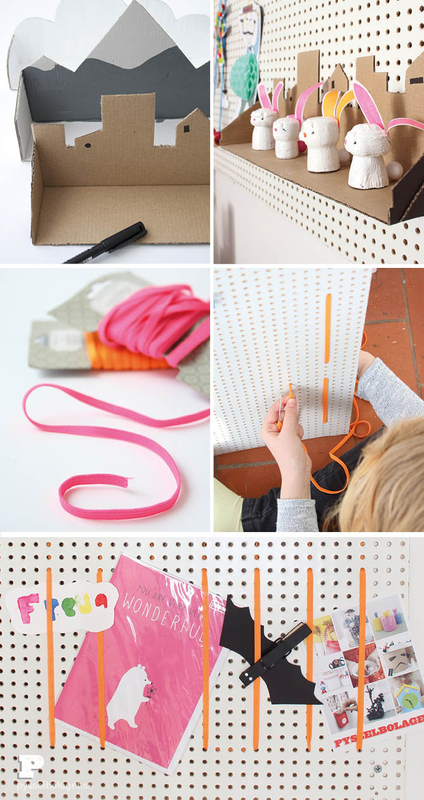 We attach the clips to the pegboard with ribbons tied at the back. 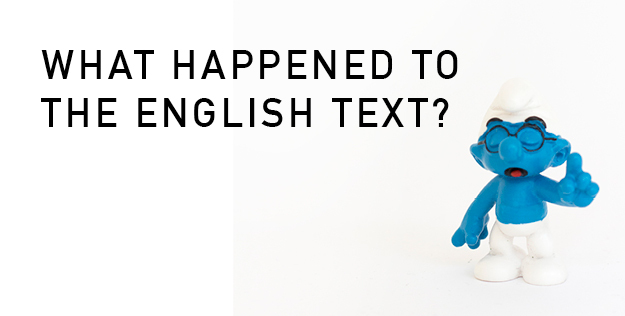 In an box of used toys we found a bunch of letters in plastic. The plastic tabs on the letters fits exactly into the holes of the board. Lucky us! 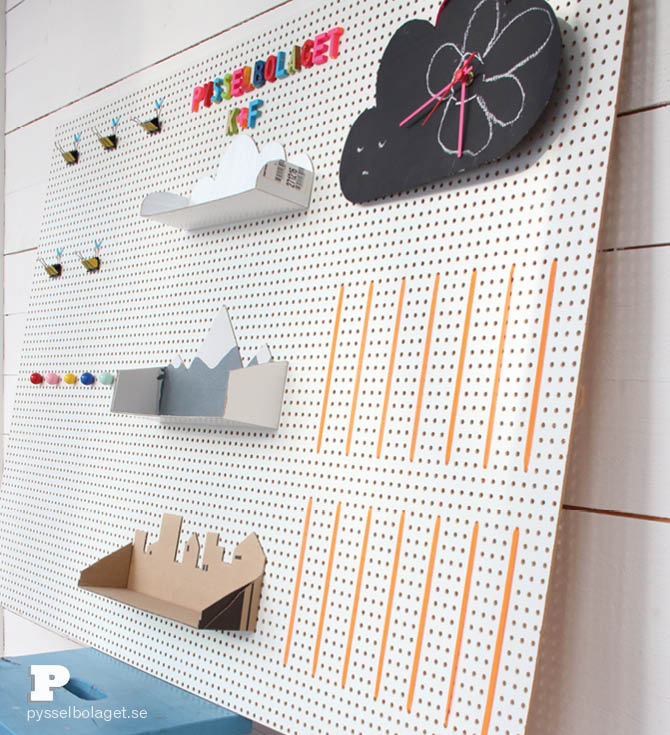 Hooks for pegboard can be sometimes found in hardware stores. Or you can make your own. We use plastic beads and small screws to make our. Recognize any of the things we have hanging on our new hooks? 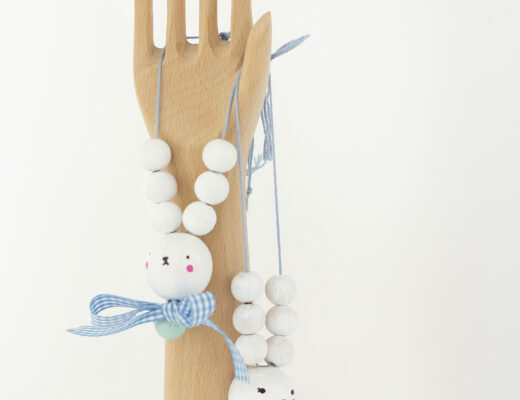 The honeycomb characters can be found here, the doll face necklace here and the melted bead bracelet here. 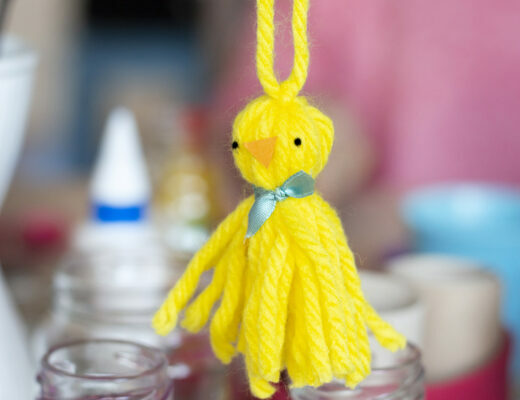 It’s nice to be able to reuse some of the crafts we made on the blog over the years. These cardboard shelves come in handy here. A tutorial of how to make the shelfs can be found here. We attach them with contact glue directly on the board. 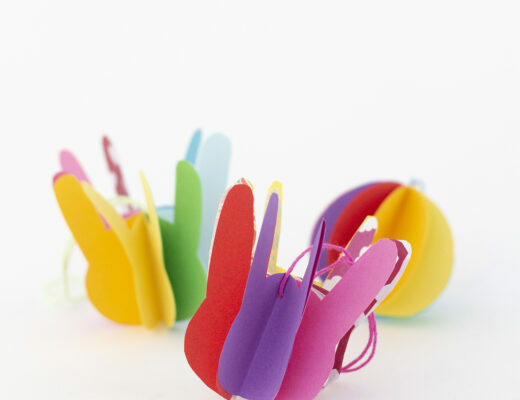 The wine cork bunnies from Easter fits perfectly on a shelf. Another way to display cards and pictures is by using elastic bands. We use a big needle to thread the elastic band in lengths through the holes. If you want to make a bat peg, you’ll find it here.